As part of the Utilities Long Range Plan (ULRP), the Utilities department will be installing road curbs and paving the section of Wilson Drive between Stepan Drive and the Wellness Center (refer to diagram). The work will require a road closure and will be completed May 14 through May 18. 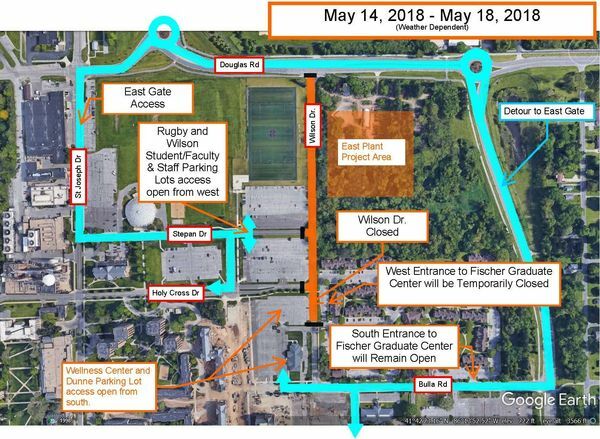 Wilson Drive is scheduled to be reopened by noon on Friday, May 18, 2018. Originally published by Dan Shoop at evp.nd.edu on May 10, 2018.